There was a lot of heavy breathing coming from the back seat of the car. The windows were down and the wind was flying through the hair, the white flying dog hairs. Ellen (human) and Luna (Great Pyrenees) had just adopted Stanley – another big fluffy white Great Pyrenees. 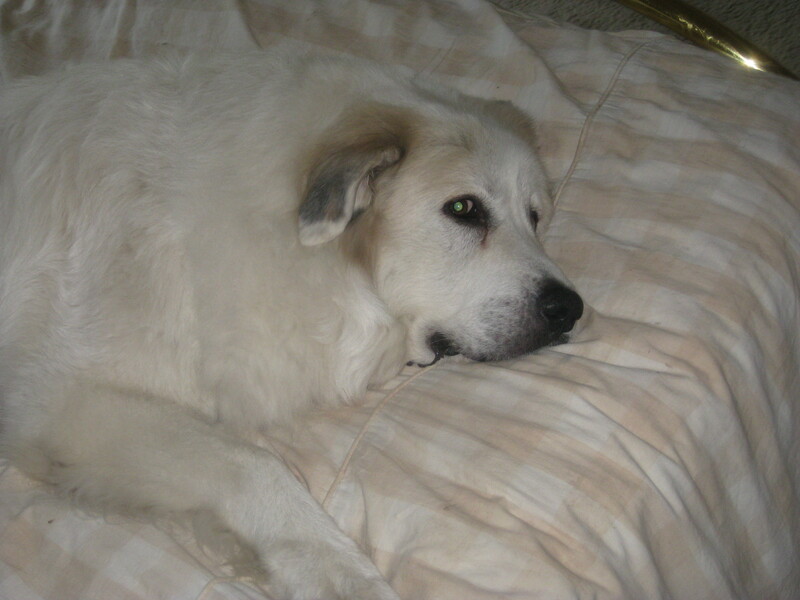 This week in “Rescue Me, The Rescue of the Week”, I am focusing on Great Pyrenees Rescue in Elbert Colorado – www.pyrescue.org. The Great Pyrenees Rescue is run by Linda and John Kryder, a couple that has been married for almost 60 years and work together as a team for the betterment of the 9 dogs that are currently up for adoption. The website says they have placed over 800 dogs, I thought they said that they had placed over 1700 dogs. Linda and John Kryder will drive around in the Rocky Mountain region (maybe even a larger area than that) to either pick up or deliver Great Pyrenees. They consider themselves to be a middle ground – they know that all the dogs will find great homes and they are patient. The Kryder’s have a very nice set up for the dogs. There are 3 fenced acres for play time. There is a meet and greet area for the people and dogs. They have wonderful kennels and runs for the dogs to be in. They have an intuition about who will be the right person for these dogs, yet, the Kryder’s allow the dog to pick. They said that the dog knows when they meet with people who their people are. The Kryder’s got their first Pyrenees in the early 1990’s and went through many trials and tribulations to figure out how to deal with such an independent thinker as their puppy proved to be. With all the ups and downs, it still hooked them to that breed! 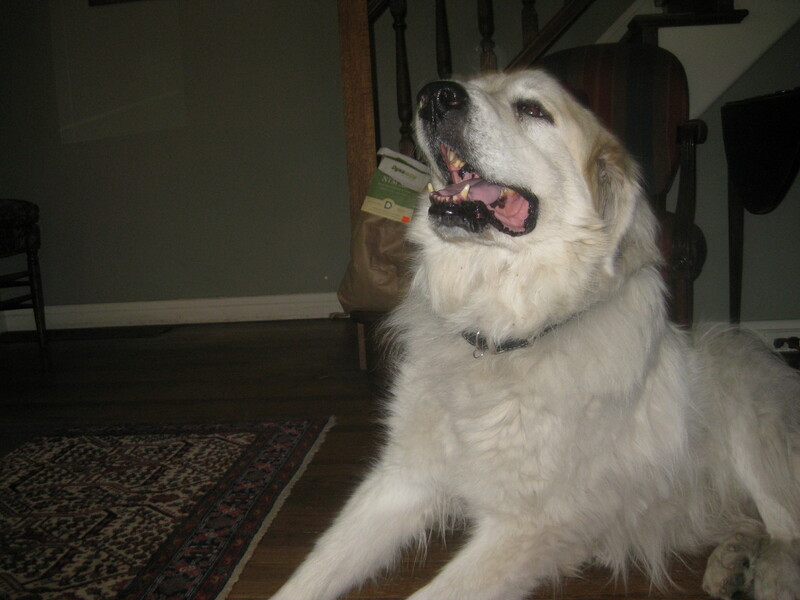 Now they have gone to the dogs – the Great Pyrenees. Some fun things to note about Great Pyrenees is they are mountain dogs, hailing from the Pyrenees mountains – Northern Spain and Southern France. They are herd guardians, they could guard from a sleeping position. Make no mistake; they can go from zero to 60 with an impressive bark and standoff ability in about 2 seconds! When in a home, these guys could be put in the couch potato category – in fact they could guard from bed. Great Pyrenees are wonderful companions as well as still great livestock dogs. They are becoming known for their rescue work as well as their therapy work and excellent in fun competitive disciplines. They adapt well and are social. They recognize predators and have a special nurturing side for small, young or sick animals. If you are looking to adopt a Great Pyrenees, take a look at the dogs that Linda and John Kryder have – one couple is driving from Florida to pick up their second dog up this weekend!! Or if you are looking for a wonderful, caring rescue to donate to – www.pyrescue.org. Stanley (pictured above) has settled in nicely at Ellen’s house. And of course Luna (pictured below) rules with an iron fist, or paw…..from the bed! 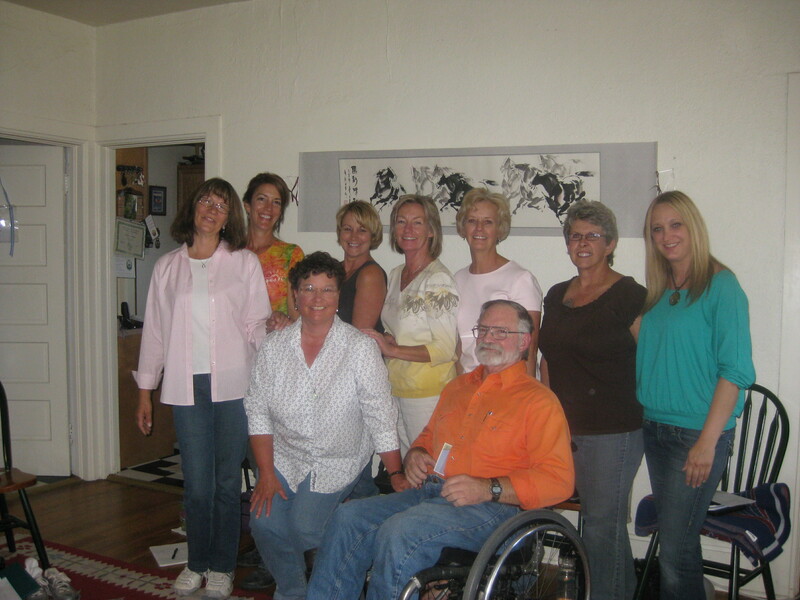 I’m here in Denver, after teaching a 3 day Animal Communication workshop. It was fun, it was intense, and, it was grand. I enjoyed everyone in the class and we were really lucky that this group of strangers came together so quickly and was so cohesive. Obviously the people that are drawn to my classes are truly empathic and love animals. I tend to draw another type of person to my group which is what I refer to as the ‘smarty pants types’. Very smart, usually women are drawn to my style of teaching and my workshops. This is a great thing as I love smart! The drawback is sometimes they tend to be the type of person that is a little (or a lot) in their head. What does this mean? They are most likely to doubt themselves. They are also used to a certain amount of success in other aspects of their life, so they are terrified of feeling wrong. This was expressed in a really profound way by one of the students. She shut down at first and claimed she wasn’t getting anything from the animals. She was really frustrated. Eventually, she turned this around for herself and started picking up on the telepathy – the pictures, words and feelings from the animals. Her courage and her commitment to be present was astounding. She allowed herself to stretch and grow by leaps and bounds. This helped everyone expand also. All ships rise with the tide. Kathryn’s wonderful Ted talk helps us see what else is available when we understand that it is okay to be wrong. Sometimes that’s just where life takes us! The theory of being wrong as part of learning is explored and proven in a new book called “The Talent Code, Greatness Isn’t Born. It’s Grown. Here’s How.” by Daniel Coyle. If we don’t allow ourselves to ‘feel’ wrong, we can’t learn. Ultimately, animal communication isn’t about being right or wrong. Rather, it is about increasing accuracy. Accuracy becomes like a developed muscle, creating a neuropath way to heightened intuition and better understanding of all beings. With that, we can compassionately help shift, adjust or facilitate healing for all life. I’m really proud of the growth of all the students and love how far they went in a relatively short amount of time. And, note to self: get out of your head and allow yourself permission for accuracy – and always be open to learning!! For upcoming workshops, teleseminars, Dolphin trips and more: http://www.joanranquet.com/events. If you are interested in The Home Study Course or Communication with all Life University, please e-mail me @ joanranquet@joanranquet.com. For wonderful feed/supplements for all life: www.dynamitemarketing.com/joanranquet.